It's rock and roll, rough-edged as it should be, with a disheveled image and immature attitute...and a few unique instrumental tricks. 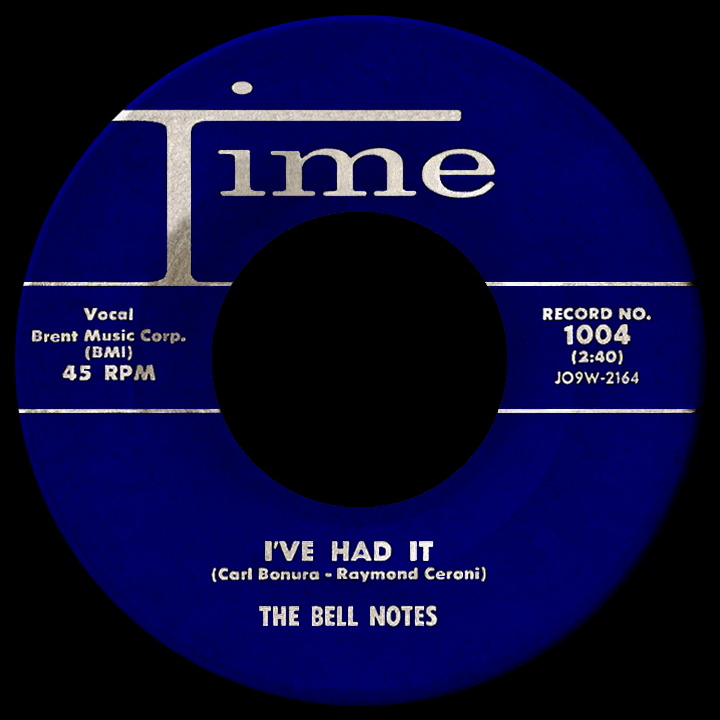 "I've Had It" by The Bell Notes kicks off with maracas (seldom heard in the popular songs of the '50s besides some of the era's Latin hits and Bo Diddley's recordings with his maraca-shaking sidekick Jerome Green), then Ray Ceroni bends the notes of his guitar as he works his way down the neck, creating an off-key effect that actually sounds right. He wasn't the first to try this, yet for years axe men have obsessed over the sound of the record, seeking ways to incorporate such a rebellious maneuver into their own music. Top it off with unruly vocals and enough rhyme-challenged lyrics to make the over-30 oldsters cringe ('When I saw her on the corner...then I knew that I was a goner...') and you've got yourself a rock classic, albeit a mostly-overlooked one. 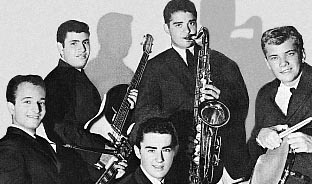 In 1957, two would-be boppers assembled the East Meadow, Long Island band's lineup. Saxophonist and high schooler Carl Bonura and recently-graduated Ceroni of close-proximity Levittown were joined by bassist Lenny Giambalvo, pianist Pete Kane (an East Meadow High schoolmate of Carl's) and drummer John Casey from nearby West Hempstead. In '58, the quintet, anxious for some action, caught the attention of deejay Alan Fredericks, host of the "Night Train" show on Long Island's WGBB radio (the station's studio was just down the road in Freeport), and he invited them to prove they had the chops by playing at one of the local record hops he emceed. Fredericks then put in a good word with Bob Shad, who was in the process of establishing his Shad, Brent and Time record labels; "I've Had It" was released on the latter at the end of the year and began climbing the charts in January of 1959, becoming a fast-developing hit that reached the top ten in March. Ellie Greenwich later claimed she wrote the song (credited to Bonura and Ceroni on the Time single) and had performed it in New York and at some of the same Long Island record hops frequented by the Bell Notes. 18 at the time and still a few years away from her impressive success as a Brill Building songwriter, she lived with her parents in Levittown but spent most of her days in the big city trying to wedge her foot into the doors of various record companies. Though already off to a modest start as a singer with RCA Victor under the name Ellie Gaye (her single "Cha-Cha Charming" had come out almost a year before), success wasn't yet within her grasp; hearing "I've Had It" on the radio in early '59 and realizing she hadn't received what she felt was her due, she consulted a lawyer...but it was her word against the Bell Notes boys, as she hadn't copyrighted the song. Lesson learned; Ellie wouldn't make that mistake again. 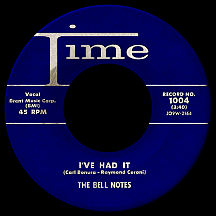 The Bell Notes followed their smash debut with "Old Spanish Town," a midtempo romantic ballad penned by Fred Johnson and longtime Savoy Records staffer Leroy Kirkland; it had a minor chart run in the spring. Then, in a case of odd timing, the band was immortalized, quite negligibly so, as part of an allegedly collectible series of "Nu Trading Cards" marketed as "Rock and Roll Recording Stars" that sold for five cents a pop (in packs of three). 64 music acts of the era received their own gum-sized card (without the gum) in this mid-1959 set, a number of them successful singers that few, if any, would classify as rock (Teresa Brewer, Perry Como, The McGuire Sisters, Dean Martin, Louis Prima and others). Some were of a more fleeting notoriety (The Impalas, Skip and Flip, The Tassels, The Tempos and The Mystics), but there was little doubt as to their appeal among America's young rock and roll fans. Yet Long Island's latest hitmaking hotshots fell below even that line of ephemeral fame...their "Nu" card name was misspelled "Belle Notes." Three more Time singles made the rounds before year's end; "That's Right" (with some boss guitar licks) and urgently-paced, semi-novelty rave-ups like "You're a Big Girl Now" and "White Buckskin Sneakers and Checkerboard Socks" failed to connect, even in the group's N.Y. stomping grounds. They kicked off 1960 with "Little Girl in Blue" on Autograph Records, then Larry Uttal gave them a shot on his Madison label. "Shortnin' Bread," a standard of uncertain origin, is widely considered among the early 20th century works of poet James Whitcomb Riley (the author of Rhymes of Childhood); the song became an instant hit with children who, in many cases, learned it during the beginning years of elementary school (who hasn't sung along with 'Mammy's little baby loves shortnin', shortnin''?). Recorded versions credit Romanian musician Jacques Wolfe and American lyricist Clement Wood. Out of dozens of artists that committed the tune to shellac, The Andrews Sisters had the best selling version in 1938. By the summer of 1960, "Shortnin' Bread" seemed ripe for revival as a rock and roll song; the Bell Notes' recording wound up in direct competition with a version by Webster, Massachusetts group Paul Chaplain and his Emeralds. Each is a solid rocker, the main differences being the Notes' unison vocals with 'yeah-yeah-yeah' female backing singers versus Chaplain's solo, and oddly unconventional, vocal delivery. The labels of both singles had one thing in common: neither acknowledged any songwriters. The band squared off on the national charts with the Emeralds disc pulling slightly ahead, but neither record racked up much in sales or airplay. It was the last chart record for the Bell Notes and the only one for Chaplain. One final Madison single, "Real Wild Child (The Wild One)," put a less cartoonish spin on the '58 hit by Ivan (a pseudonym for Jerry Allison of Buddy Holly's Crickets), who'd covered the more straight-ahead original by Australian rockers Johnny O'Keefe and the Dee Jays. No further Bell Notes recordings were made and within a year the band members collectively said "I've Had It"...or maybe they just hung up their rock and roll 'skillets' for good without resorting to clichés. But wait! Reliable sources have reported that some of the members, two or three at a time, have occasionally been spotted through the years performing in and around New York, keeping the notion alive that The Bell Notes are more than just a fond, distant memory for fans of rough-and-tumble rock and roll.